The best possible version of the 35mm stereo mix can be produced by using the early US laserdisc (since it has the most dynamic range) and adjusting its EQ to match the print/SWE versions. That way you get the best of both worlds; the greater dynamics and the correct frequency balance. This is exactly what I did for the 35mm soundtrack on Despecialized v2.5, but I haven’t yet put out one like this that is synced to 4K83. You might know this already but it can be done almost automatically in Izotope RX with the “EQ match”. Not sure how accurate the result is though since I don’t have an expensive audio setup to compare it with, but I know that piece of software is amazing. I will release a track like that at some point soon, but for the moment, I would recommend using the SWE version, because it sounds extremely similar to the print audio, but with better quality. I’m not sure if the SWE version was included in the myspleen release (is it the 1993 LD audio?) but I think I’m just gonna settle with the optical for now, it sounds great! First of all, Williarob: For being home made, I could still swear you had used a real professional scanner for 4K77 and 4K83! Amazing job. Interesting, the LPP does seem to have a lot more blue in it, but also more preserved yellows. I hope it’s ok I keep asking some things here. It’s just so interesting since I’ve been away from these things for a few years and to come back and see actual prints being restored like this is a joy. Harmy’s Grindhouse was from a different print than our LPP. I don’t know how much, if any, color correction was applied to our LPP: I received it as a Bluray ISO. 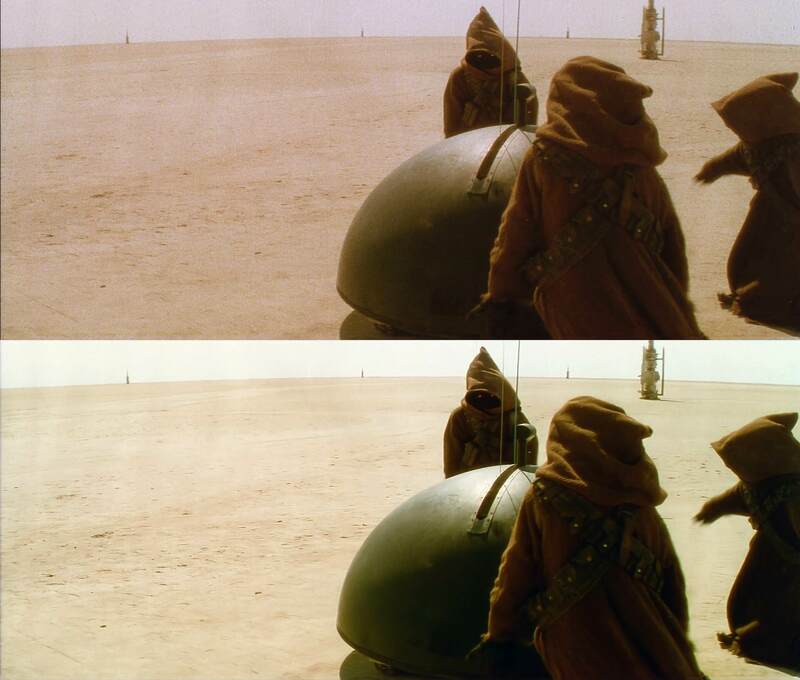 I would imagine at least some basic color correction was done, but it would have been applied on a reel by reel (or even one setting for the whole film). I’m hoping to get access to a better version of the scan soon - not for the purpose of restoration, but for use as a color reference. Oh and about the audio: What would be the best, technically speaking, the optical audio or that US LD 1983 mix? When comparing them, the optical sounds more “full”, more bass in it. I’m sorry, I had no idea that there were two separate prints! So the one that has been shared before was the LPP and you based your 4K83 on this Eastman print? The image quality of 4K83 is amazing, but those LPP shots you posted have none of the color errors I noticed in the 4K83. Subtitles are balanced white without any visible tints, the shot of the barge in the desert is warm which I imagined it to be. So basically, you’re saying that the Eastman print was more preserved than the LPP except for the colors, and you chose to base your restoration on it because of the resolution? Is the scan of the LPP not in 4K since it wasn’t used instead? What ChainsawAsh said is something that would’ve been nice if it could be done shot by shot, unless someone restores that LPP print in the same way. Really interesting either way. EDIT: I forgot to ask: Has that LPP print went through any color correction too or is it raw? This one looks more or less the way I expected, just a little brighter maybe. This one looks quite ok with the subtitles being white with just a tiny green tint to them. These two have cyan subtitles and whites, this is interesting as well. 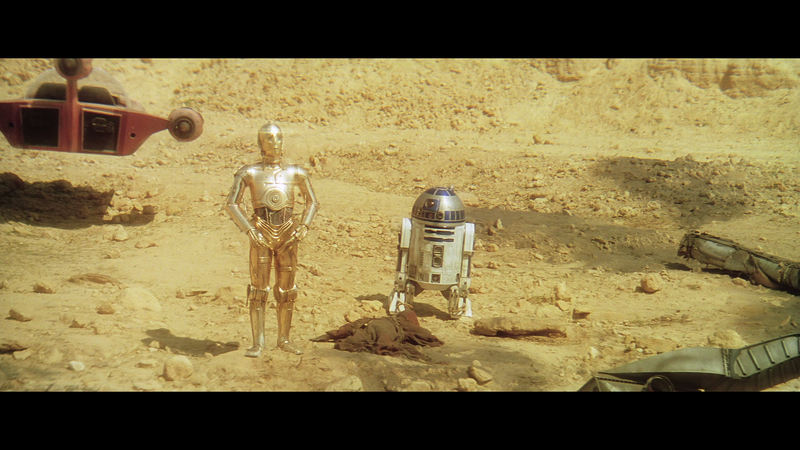 I expected this shot to be a lot warmer, and that whole scene since it’s set in the desert. Of course that’s based on all the previous versions of ROTJ! Overall, the quality of both the picture and audio of this release is simply stunning. Good job everyone! It should also be noted that while two “1985 Home Video Mix” files are included in the Alternate Audio folder, they’re actually the same as the 1983 theatrical mix, of which Schorman says the one marked “1983 - Stereo (US Source)” is the best quality. Thanks, so both the Japan and US ones are from 1985 LD releases? Looking forward to compare them. It’s not really an alternate. I just posted it individually in case anyone might like to download the track by itself, without the rest of 4K83. I named it “[Cleaned]” because I worked on it, and I don’t want it to be confused with the untouched audio, which I didn’t share, but could if anyone really wanted it. Thanks, the ac3 file might work better with my blu-ray player. Good to know they’re the same. The main track that I heard when previewing the mkv sounded great. *4) Optical stereo soundtrack provided by TN1, sychronized, declicked, and denoised by me. Wait, if the optical stereo track included in the mkv is already cleaned up, why is there a separate version in the “alternate audio” folder named “ROTJ - 35mm Optical [Cleaned]”? I haven’t finished downloading this yet but I have some questions about the audio. Sorry if they’ve already been clearly answered, I’m too tired to read through the thread at the moment. What’s the difference between the optical audio track packed in the mkv file and the “cleaned” one? And are there any digital tracks that actually matches the theatrical stereo audio? I see the 1993 LD track is there but weren’t all the 1993 LD mixes altered? The 1983 Japan and US sources, are they from LDs too? On the other hand, it’s really nice that all of the colors are preserved so well in 4K77 that we can even create corrections based on the reference using the 1080p version which is “compressed” both in color space and resolution. Your corrections are really nice too! I’m pretty sure I would’ve gone with something brighter if I “corrected” it. You’re right. After digging into it, the 4K77 isn’t perfectly matched to the reference some of us had access to long ago. Either way, I made my shot that bright to match it to the frame from SkyMaster edition so they could be compared. The hue, however was left untouched after balancing the white and black points while leaving the mid balance as it was. When I looked at a piece of reference material and changed the gamma curve to look more like it, my hue wasn’t very far off from the reference. And knowing the reference had the pink tint unfixed and not balanced black and white points, my shot still came out pretty much correct in colors, just way too bright in the comparison with SkyMaster. No detail missing in my version since I didn’t crush the whites or blacks. Your version is closer to what it looked like when it was shot, my correction examples are aimed on keeping the theatrical color timing. What I meant was that the SkyMaster edition isn’t keeping the mid balance of the Tech print thus creating a different color. I’ve often found that by leaving the midpoint alone and only adjusting white and black points and gamma curve, you can often get the “correct” theatrical look of each shot if you’d want to. Anyway, I found lots of errors with the SkyMaster preview. It had crushed whites, it wasn’t a screenshot error. The DNR overall looks superior to the official DNR version, but it handles dark scenes badly. (The official DNR version looks great too of course, except for the automatic color balance in each shot but that’s my opinion since I love the theatrical look and I’m so much into colors) There are lots of artifacts in the dark scenes in the SkyMaster preview. Note that these are errors with the DNR filter, not criticizm from me! 😃 Pointing them out might help? 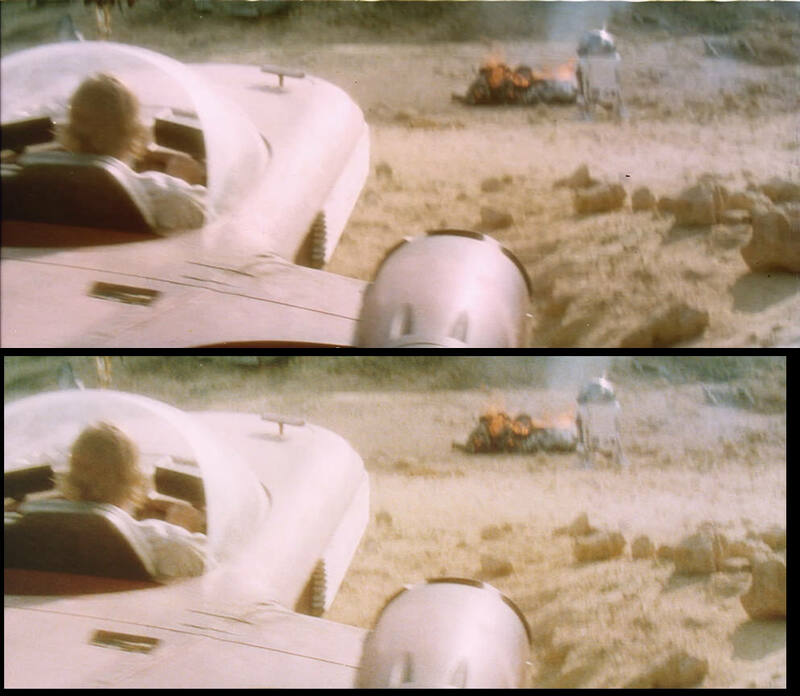 I also think it looks kinda strange to basically use a blanket tint in the scene where they talk to Han. It removes almost all the color from the picture. 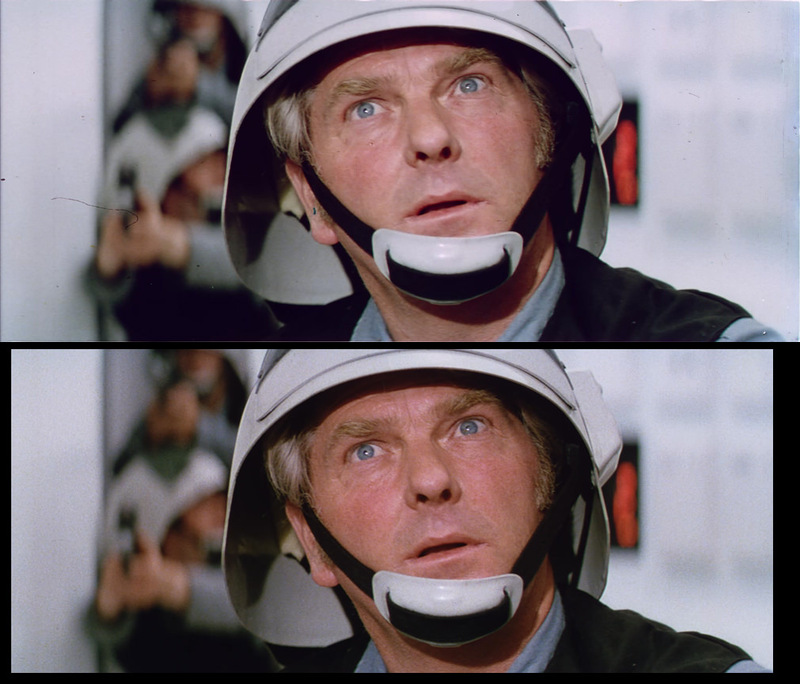 Here’s those two shots from 4K77 compared to my corrections, to give an idea of what it could all look like if someone ever did a proper shot by shot correction. (Which would of course take a horrible amount of work. I still think the 4K77 looks amazing as it is!) I used the 1080p version for my corrections since it’s the only version I have, so if you see any compression artifacts it’s just because the source isn’t lossless. Whites and blacks were balanced while keeping the mid balance and altering the gamma curve. I’m gonna watch the preview and see what it looks like. The screenshot has nice details but is slightly too green and the whites are crushed. But I suspect this is a case of conversion between 16-235 and 0-255 that has caused it. It’s also more cropped, but that’s understandable if it’s based on more sources. i thought this frame was from The SkyMaster Edition and not The Skywalker Edition? What is the difference? I think I saw some clip on youtube once saying that the Skywalker Edition was gonna have chromatic aberration sorted out and all that, color channels aligned etc. That must take forever to do. Starting with the noDNR version, I used Neat Video to reduce the noise. 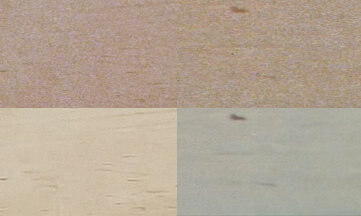 A single noise profile can be used for the entire film and give you pretty good results, but for better results you will want to create a separate noise profile for each of the noisier shots: The smoke filled corridors on the Tantive, the droids in the Desert, “Look sir, Droids”, the sandcrawler coming over the Dune, the imfamous speeder scene, and just about any shot with a white/pink flash. Every single shot in those sequences had it’s own noise profile, because the level of noise varies greatly. I had initially set out to create a separate noise profile for every single shot in the film, but quickly discovered that even with an 8 GB video card and 128 GB of RAM, you run out of memory way before you run out of shots doing it that way with 4K footage. This is something that was very, very well done and I kinda expected it since as Mike Verta once pointed out, some scenes had so much noise and/or color noise in them even on the negative that there’s not much detail to dig out of them, like the speeder shot in Mos Eisley. You’ve done an amazing job on all that. Anyway, that took weeks, and when it was done it became obvious that all of that noise was hiding tons of dirt and dust that suddenly became very distracting. So I had to go through the entire film again, cleaning up the more distracting dirt and dust - and there’s still plenty left. Another impressive thing that’s been done. While I was in PFClean, I used the Color Balance effect to automatically balance every shot. This is the part that should’ve been skipped, I know it from photoshop and premiere and in 9 out of 10 situations it doesn’t do a good job. It’s most likely what created the huge inconsistency. So I’m sorry if you don’t like this version - I’m not 100% happy with it myself - but I honestly believe that using both of these versions as a starting point, I’m giving you and everyone else just about everything you could possibly need to make your own dream version of Star Wars - with the noDNR version alone you now have access to a more or less untouched, relatively clean, complete version of Star Wars in 4K to play with! It wasn’t so long ago that the best version we had was the GOUT. First of all, I’m very sorry if I bashed you too hard. I guess I looked forward to this version a little too much, and having worked on similar projects I tend to be very picky about color work. My apologies. If I had a better real life I would’ve given it a shot probably, though I have 6GB ram so I bet my computer wouldn’t be able to handle working on a 4K movie. I’ll be checking back here and on myspleen every now and then and hope someone else who are able to do it will render another DNR version. It just made it look so much cleaner and I don’t often say that about DNR, with things like Predator Ultimate Hunter Edition in mind, or that new release of Jurassic Park. But there are multiple offshoot projects in the works that use 4K77’s lossless source files as a base, as Collipso said, so you’re probably gonna want to wait for one of those to come out. Looking forward to see what’ll come out! Nope, Rob used Neat, if I remember correctly, which is pricey professional-grade software. Pretty sure I can get my hands on that anyway. 😃 Sadly I don’t have time to do much of these things anymore but if I ever have more time I will try it for sure. It did a better job with DNR than anything I’ve seen before. You should’ve taken the final 4K77 and applied the DNR without the excessive sharpening. Not much would’ve been needed to remove the pink if you think it’s too much (you would only have needed to balance the white point) and it should’ve been done reel by reel, not shot by shot since that requires extreme care and consistency. The DNR release is very, very inconsistent in its color from shot to shot and some shots look a lot cleaner in the original. 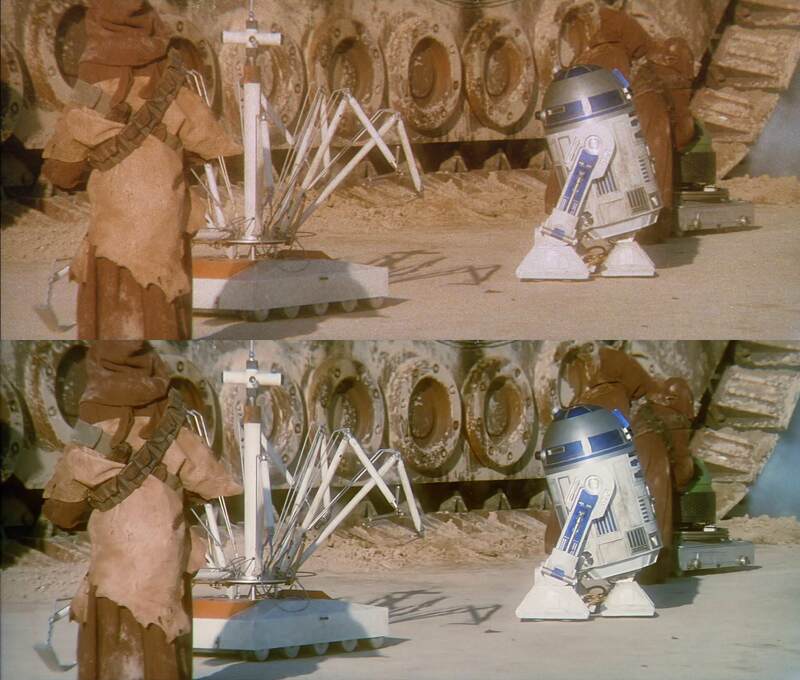 R2D2 in the canyon is oversaturated and has purple shadows, as if you went back before the color correction done to your first release, and that’s just one example. As you can probably see, the inconsistency in the DNR version is very visible here. Is there any chance we could get a proper DNR version in the future? Or that we could learn how to render one ourselves? I’d really wish to get rid of the print grain since it’s not the original negative grain anyway, but without the inconsistency in color. The colors are amazing in the first 4K77 release and wouldn’t need much tweaking if one wanted them to be a little more balanced. If you used avisynth for DNR I’d love to know the settings. When I’ve tried it in avisynth in the past, DNR just makes fast moving scenes look smudged so to speak. Looking forward to watch the DNR version. Though I would’ve loved if you released a DNR version with the original colors and not as oversharpened (looks like it’s vertically sharpened?). Remember, these are just my opinions and not really criticizm anyway, and only based on looking at the screenshots. I think some of the shots look too cyan, (desert scenes should look warmer I think) and the shot of Leia looks as if it was matched to the old shot from Mike Verta. That shot of his has too bright whites and too dark blacks to match this to if not doing the whole thing with the same settings since the rest seems to have been kept soft. It’ll be interesting to see if the DNR handled fast moving scenes well! Sorry that I don’t visit OT often anymore. Real life is hell, basically. Wow. The original looks even worse than I thought. The amount of cleanup is amazing. Remember that the cinema presentation is more cropped than what is on the full frame of the film. Very correct. I looked at a couple photos from the Senator screening and it’s amazing how much more can be seen in 4K77. When screened there it cropped out a lot more especially on the sides. This was an accidental double post but I’ll use it to post one more comparison of a shot they had to crop a lot less. Looks like it was done to get the most out of every shot while stabilizing them. Maybe the SSE didn’t need as much motion correction as 4K77? I know it takes some cropping to achieve a more stable motion. Or maybe the “normal” 35mm prints like the one SSE is sourced from were less cropped than the Technicolor prints? EDIT: After looking at a few shots from the previews I have it at least looks like the source for 4K77 was jumping around a LOT. It’s not strange they had to crop it to keep a stable motion. Hairy_Hen has done a new theatrical mix that he has just released as part of 4k77. But that’s the 70mm surround mix, right? I thought the 1977 stereo track came from an LD release. ^ If all you want is English 2.0, the first track on the MKV should be fine. That’s the track that would be most true to the actual track that was on the Technicolor print, right? Either way, why do they say “2018” at the end? Has someone done some kind of better rip of it from the LD? You’re doing an amazing job. Depending on how the DNR version will look in fast moving scenes where I know a lot of such filters can struggle with noise/grain it might turn out my preferred version, but the non-DNR versions released so far looks amazing of course. The only thing that strikes me with those two screenshots right away is the amount of edge ringing. Especially visible in the shot of Leia. Now I don’t know which filters (or even software) you’re using to do it, but if you add sharpening after the DNR, I guess it’s better to not do that. At least from my experience of experimenting with such things in avisynth a few years ago, I always got the best result by sharpening on grain level before applying a filter and then blurring it back so to speak. Msharpen(1).Blur(0.4) was the method I used for grain level sharpness back then. It would be interesting to see some shots from your DNR version in fast moving scenes. I remember mvtools in avisynth was never good at handling that, at least. Now of course I never tried it on something with such high resolution either. Oh and sorry if I’ve missed any previous info. This project made me jump back on the forum to check it out. I’ve had a few very rough years and this sparked my interest in SW restoration projects a bit again.